Angry bureaucrats, scooter bans and public backlash—sometimes scatological. Scooters arrived in Portland in a carefully crafted arrangement with City Hall. That's in part because scooter companies tried gate-crashing in other cities—and ran into trouble. The startups took an aggressive approach, mirroring how ride-hailing giant Uber flouted Portland rules by offering rides in 2014. The result? Angry bureaucrats, scooter bans and public backlash—sometimes scatological. What happened: Santa Monica is the hometown of scooter startup Bird. The company deployed its e-scooters last fall—and weeks later, the city sued. Bird paid $300,000 in fines and secured permits. This summer, the city began voting on regulations, including which companies would be given permits and how many scooters would be allowed. Current status: A city council committee recommended two companies—Lyft and Jump—be permitted to operate scooters. People actually showed up to protest last week because Bird and Lime weren't picked. The committee said it based its decision on Bird's and Lime's failure to comply with city rules. 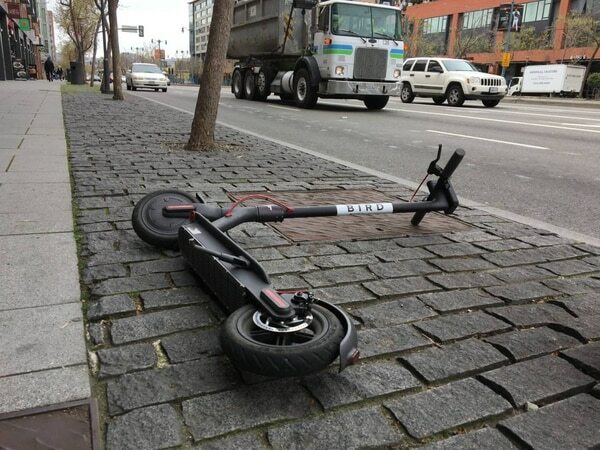 What happened: Bird, Lime and Spin all unloaded electric scooters on San Francisco sidewalks without asking permission. Backlash was swift and severe: People tossed scooters in trees or smeared them with feces. By June, city officials banned scooters, and threatened that any found on the streets would be impounded and the company would be fined $100 for each impounded machine. Current status: Banned—for now. City Hall is expected to allow permitted companies to return by the end of the month. Current status: Banned but running. The department is still voting on speed and safety rules, even as the machines keep humming along. What happened: On June 1, the city threatened to confiscate any scooters left on the street. They nabbed around 300. Scooter companies were fined around $40,000 and made to obtain proper permits. Current status: Scooters are back. They must ride only on sidewalks, and must park only at bus stations. Current status: The city voted to allow the scooters, as well as dockless bikes, on Aug. 1—and they were reintroduced to the city last week. What happened: One hundred Bird scooters landed, but the city immediately issued a cease-and-desist order, telling Bird to remove the scooters and not replace them because the company didn't have a permit to leave the scooters on the sidewalk. Current status: Banned. On Aug. 18, a 21-year-old woman was killed while riding an electric scooter rented from a local shop. The death made headlines as the first in the country—but it resulted from an allegedly intoxicated driver who overdosed on heroin moments after striking the woman and is being charged with aggravated vehicular homicide. When they launched: They didn't. There are no scooters in Seattle. What happened: In late April, the city of Seattle warned scooter companies they would not be permitted to launch in the city. In late July, Seattle passed permitting regulations that would make scooters possible. Current status: No scooters yet—but if you leave Portland now and head north, you can probably get a Lime there by the end of the week. Frankie Benitez joined Willamette Week in 2018. She is a news intern.